JPO’M: What is the central thesis of your new book? HD: That in the aftermath of European colonialism, a series of regimes came to power in which knowledge production was conducive to postcoloniality. These were the kind of ideological formations that resulted in political leaders like Hosni Mubarak, or Ben Ali. They come from a combination of Third World socialism, postcolonialism, nationalism and native Islamism. But this has come to an end. So Arabs and Muslims are now on a level playing field. As a result, you have not only new regimes that will come to power, but new regimes of knowledge that will come to power. JPO’M: You argue that “the West” has lost its potency, why so? HD: Well even if you look at the construction of the term, it’s a binary opposition that was never a solitary construct: just look at the recent book by Niall Ferguson: The West and The Rest - “West” was always in juxtaposition and necessitates “the East, Islam, Arabs, or the Orient “ in order to justify itself. My primary proposition is that this binary has collapsed, not just in the west. The whole notion imploded in the aftermath of the collapse of the Soviet Union. The formation of the European Union already posited a different set of priorities that were not always automatically conducive to US strategic, globala and imperial interests. Now there are marked differences. So this idea of the west in binary opposition doesn’t have the same potency that it did from the early nineteenthcentury to the height of the Cold War. JPO’M: In your book you maintain that “Islam has exhausted itself”. Are you thinking about the collapse of the Islamic Republic of Iran? HD: I think the Islamic republic has lost both its potency, and its legitimacy. As soon as the revolution in Egypt happened in January 2011, the leader of the Islamic Republic called it an “Islamic revolution”. The Muslim Brotherhood then responded by saying that it was not an Islamic revolution, but an “Egyptian revolution”. The Islamic republic has lost 30 years of legitimacy, because it has been 30 years of repression. What we are experiencing right now is its aftermath: the formation of a very potent, active, and effervescent, public space, which is not under the control of the ruling regime in the Islamic Republic. It has worked itself into a garrison state with no organic link to the rest of the society. Regimes like the Islamic Republic have no legitimate link with the people except for brutality and violence. JPO’M: You seem quite confident that the Arab Spring will not become hijacked by Islamic fundamentalists. What evidence do you have to support this argument? HD: I am very confident of this. First of all we have to understand that the Islamic theocracy was one revolution in one nation-state. Two factors distinguish the rise of the Muslim Brotherhood in Egypt. Number one, they are Sunni’s, not Shiite. Therefore the proclivity of the Shiite communities to support charismatic leaders like Ayatollah Khomeini, does not exist in the overwhelming Sunni population of the region. Furthermore, none of these ideologies, such as that of the Muslim Brotherhood, have any particular claim over the majority of the population. Certain football teams in Egypt are more popular than the Muslim Brotherhood. Also, the example of the Islamic Republic is the best historical mirror to hold up in front of the Arab population, for what not to do. Lastly, and most significantly, what we are witnessing in the Arab world is transnational. JPO’M: Will women play a significant role as the Arab Spring moves forward? HD: Well women’s rights and feminist movements have been in the Arab and Muslim world for a very long time, in both a secular and an Islamic version. The Arab Spring has simply expanded the public space in which the women’s rights movement will be exercised. Women are integral to this movement. I guess the question we face is not whether a Sharia-type inquisition or an Islamist rule will guarantee women’s rights, but the other way around. It is now time for women’s rights organisations to protect the individual rights of women’s civil liberties against any of the many potential atrocities of the state. The women’s rights movement is integral to the public space. We should be far less concerned about whether or not the Muslim Brotherhood comes to power in Egypt, or for example, whether or not it will impose anti-women and misogynistic rules and regulations, than we should be about the absolute necessity of the formation of women’s rights organisations, unions and assemblies, to protect the civil liberties of women. JPO’M: You also posit that racism plays a dominant role in Middle Eastern countries; do you believe this will change? HD: Unfortunately the racism that exists in the Arab world against Iranians or against North Africans, is a societal fact. The change in the ruling regimes does not necessarily mean a change in the society. The new regime of knowledge will have to emerge from the public space, which needs to cleanse itself of this sort of innate racism. That is a product of ethnical nationalism, something which has been quintessential in the forming of these racist tendencies. The more we are distanced from the formations of ethnic nationalism, as they were integral to post-colonial ideologies, the more the public space will provide an opportunity for us to articulate anti-racist and anti-misogynistic arguments. JPO’M: Will the relationship between the US and Israel change in the light of the Arab Spring? HD: Up until now the United States and Israel have had one singular role in the region to play: that of the counterrevolutionary. They have been in cahoots with Saudi Arabia to prevent this tsunami of democratic revolutionary uprisings, or, to micromanage it to their benefit. The main reason for the false alarm around the Iranian nuclear project by Israel is to distract attention from the fate of Palestinians, and from the democratic disposition of the Arab Spring. Israel has built itself upon the very ideology of opposing Arab democratic conditions. It is chiefly responsible for trying to control them, seeking to detract from these revolutionary uprisings. JPO’M: Could you explain this idea of getting beyond Edward Said’s Orientalism? HD: I will begin by emphasising that we are all standing on the shoulders of the giant that was Edward Said. What I have to say is not a negation of Said, but a confirmation of what he says by transcending it. We need to change the interlocutor, and the fictive white man that was sitting in Edward Said’s mind, who spent a productive and magnificent life trying to convince him that the Palestinians were wronged. This does not result in a very significant change. But as a result, I believe in establishing solidarity, first of all horizontally, in the nations across the Arab, and Muslim world ─ but also in Asia, Africa, and Latin America. This kind of interlocution is far more important than trying to convince any fictive white person. There is a comparative and cross-national revolutionary uprising that necessitates these solidarities. It makes it possible for us to have interlocution not only within the public space, but also with our friends and comrades across continents. JPO’M: And the US, how do you see their role? HD:I don’t see any opportunity in American political culture to change things. The extraordinary power of money and special interests makes it absolutely impossible for the United States to be representative of the public in any meaningful way. They will continue to play this radically anti-revolutionary function ─ in cahoots with Saudi Arabia and Israel ─ but to no purpose, because these democratic uprisings are so deeply rooted, so pervasive, that they will not be diverted. JPO’M: Will this inevitably mean a violent struggle between Israel and other Arab states? HD: Well we have to make a distinction between the ruling Zionist regime and the Israeli people. 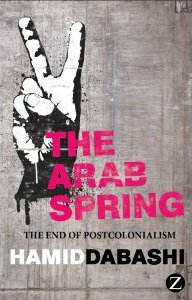 I conclude my book with a quotation from a group of Israelis who want to be part of the Arab spring. So I have every reason to believe that very soon Israelis will overcome their Zionist psychological barrier, and join their brothers and sisters in the Arab world. This will result in the only sensible outcome and the only scanario in which the Israeli/ Palestinian conflict can be resolved: a one state solution. JPO’M: In your book you accuse the novelist, Salman Rushdie, of using the western media to promote his career. Did he not have a right to free speech when Muslim clerics were publicly calling for him to be murdered? HD: I think Salman Rushdie has the right to say whatever he wants in a great novel like Midnight’s Children or indeed in a stupid novel like The Satanic Verses, and the reaction to any novelist’s work should be literary criticism. You either like the book, and you endorse it, or you dislike the book and you write a negative review of it. I categorically denounce the fatwa against Salman Rushdie. But after that fatwa, Rushdie became integral to the massive propaganda machine of Islamaphobia. This was not only irresponsible; I consider Rushdie as rather responsible for advocating Islamophobia in both Europe and America. JPO’M: You have argued that every state, throughout history, has been formed from a violent struggle, yet you argue here that this is not a violent revolution. Doesn’t every revolution incur violence at some level? HD: Well we are having a violent race for power right now in Syria, where you have China, Russia, and Iran on one side, and the United States, Saudi Arabia, and Israel on the other side, infusing violence into the situation and radicalising it. The Americans, the Saudi’s, and other Gulf states have decided to finance those who are fighting. The main violence is perpetrated by the Assad regime. As far as the race for state control is concerned, violence is still ongoing. But my concern is with the public space, and with the formation of institutional resistance, internal tyranny, and external imperialism. I understand how states operate, but my focus is more on the institutional formation of various ways of preventing a totalitarian regime from taking shape. JPO’M: So you believe any level of violence will debilitate this revolution? HD: My position is that as opposed to throwing a Molotov cocktail, or getting armed and shooting at people, the revolutionary forces need to be translated into institutional resistance to tyranny. This should come in the form of labour unions, women’s rights organisations, and student assemblies. Blind violence is entirely counterproductive. What is absolutely necessary, and what ultimately prevents tyranny, is the formation of these three institutions. JPO’M: In the last chapter of your book you say, “the Arab Spring has ended the Foucauldian reading of power and the politics of despair he theorized in his reading of governmentality.” Could you expand? HD: I detect a certain structural predisposition in Foucault’s notion of governmentality: this idea that government moves from institutions of repression into our mentality, and that our mentality in turn becomes integral to these oppressive regimes. My argument is that in the Arab Spring, we are liberated into a moment where the institutions of repression do not work, where a new form of subjectivity can be formed, which must lead to a new condition of govermentality. JPO’M: Do you see your book as contributing to the revolution? HD: Yes, I believe this book in some small way is my contribution to this revolution. I quote Marx who says, “We should not interpret the world but change it”. I say by interpreting the world the way I do, I change it in some way.